The term “value” can take many forms, and when buying and/or selling a home it’s important to understand all of them. There are five distinct ways to classify value. Although there are dictionary definitions for each, they are best understood through real-world examples. 1. Market value is the amount that a particular home is worth to a particular buyer. 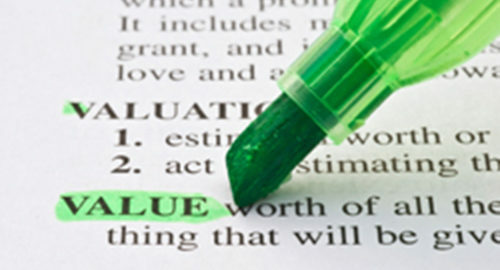 The Uniform Residential Appraisal Report appraisers use defines market value as the most probable price that a property should bring in a competitive and open market under all conditions requisite to a fair sale, with all parties (buyer and seller) acting prudently and knowledgeably, and assuming the price is not affected by undue stimulus. Implicit in this definition is the consummation of a sale as of a specified date and the passing of title from seller to buyer under conditions whereby: buyer and seller are typically motivated; both parties are well-informed or well-advised, and each is acting in what he or she considers his or her own best interest; a reasonable time is allowed for exposure in the open market; payment is made in terms of cash or in terms of financial arrangements comparable thereto; and the price represents the normal consideration for the property sold, unaffected by special or creative financing or sales concessions granted by anyone associated with the sale. This is by far the most common value considered by buyers and sellers. The seller’s home is for sale, the buyer offers a set number of dollars for it and the buyer and seller eventually agree on a final sales price which represents the home’s market value. 2 . Appraised value is the estimated fair market value of a property at a designated point in time, as developed by a licensed or certified appraiser following accepted appraisal principles. Although it’s based on a fair market value, appraised value does not always equal market value; it is an opinion developed by an appraiser based upon comparable closed sales. Appraisers will typically also consider active and pending homes, but closed sales are the basis of value. Mortgage lenders require an appraisal because the real estate will be the collateral for the mortgage loan and thus the lender must ensure the value of this collateral. Appraisals for purchases are written to underwriting standards; these are mandated by the lenders/investors (such as Fannie Mae and Freddie Mac), and appraisers are required to follow them. 3. Assessed value is the valuation placed on the property by a public tax assessor for purposes of taxation. There is no standard for establishing assessed value; this is a local call. Usually, assessed value is based upon similar past sales in the immediate area. When the subject property sells, the new owners may get the “welcome” greeting from the county; the sale price becomes the new assessed value. In an ideal world, an evaluation similar to an appraisal is performed; in the real world, assessors may drive by, may measure the exterior of a home or may simply continue to build upon past historical data (the original construction plans). The derived value is then multiplied by the assessment rate, and an assessed value is established. Buyers should only consider these values from the standpoint of how the current assessment will impact their property tax liability as unless a property was recently purchased these values are a poor indication of the home’s market value. If the homes current assessed value exceeds the purchase price, a homeowner can remedy this and reduce their tax liability by submitting a formal complaint to the county board of revision (in most counties this is done between January 1 and March 31). 4. Value in use is simply the value of a property as it is being used. However, a home may appraise at a certain dollar amount but contain specific features that make it especially valuable to a particular buyer or seller. Homes with in-law suites that allow for multigenerational living can be more valuable to occupants than the data might suggest. An at home mechanic may find more value in a home with a garage workshop than an appraiser will. A movie buff who finds a home with fantastic state of the art theater room may place a very high value on that. Some buyers speak of immediately knowing a home works for them because of some feature that it has. In a situation like this, many are willing to pay a premium price for the added utility of what a particular home offers. For them, the value of the added feature justifies a value that might not be recognized by the data. 5. Highest and best use is the reasonable, probable and legal use of vacant land or an improved property; highest and best use is always physically possible, appropriately supported, financially feasible – and that results in the highest property value. Another way to think about highest and best use is to ask the question: In the real world, does the current use represent the most valuable option? An example of this might be a tear-down. An older, smaller home in an area where new, larger homes are being built is not as valuable as a newer, larger home. Similarly, a home on 10 acres in an area that is seeing lots of new construction is likely to be more valuable subdivided and sold to a developer. These ways of looking at value are mutually exclusive; they do not have to point to the same estimated value for a property. It’s wise to understand the differences, especially potential differences between appraised value and market value. In most cases, residential buyers and sellers will concern themselves with market value and look for price support through current data. Properties with unique or special features can fall outside these parameters, and a buyer may be willing to pay a premium for them due to their value in use. By having a working knowledge of how to apply these different views, a quality agent can be an invaluable resource for a buyer or seller.